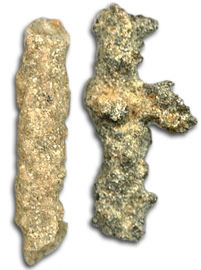 Not truly a mineral or a fossil, fulgurite is sometimes referred to as petrified lightning. The word comes from Latin (fulgur = lightning), and is amorphous “lechatelierite” silica glass. When lightning or electricity strikes a conductive surface, the temperature can skyrocket to at least 2,950F and melt surrounding silica or quartz leaving behind a glass tube. Lechatelierite can also be formed when a meteor impacts the ground, or during volcanic explosions. They vary in shape, size, and color, and can be very fragile. Larger pieces have been recorded between 13-30 feet in length. Their shape mimics the path the electrical charge took. This entry was posted in The Conglomerate and tagged fulgurite, lightning, mineral, petrified, rock on June 16, 2015 by NDrockclub. Watterson, Bill. The Revenge Of The Baby-Sat. Kansas City, Andrews and McMeel, 1991. Pg. 112. This entry was posted in The Conglomerate and tagged calvin hobbes, comic, humor on June 5, 2015 by NDrockclub. Campeloma are common freshwater snails, with an ancestry dating back to the Cretaceous of North Dakota. These gastropods (“stomach foot”) can be found at times with other snail genus, mainly Viviparus or Lioplacodes. 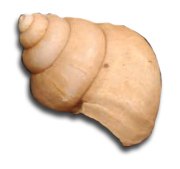 Campeloma shells tend to be bulbous, with highly convex body whorls – the spirals that make up the shell, and about an inch long. 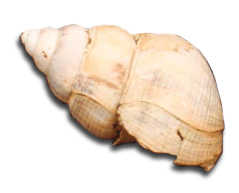 Viviparus are about the same size as Campeloma, but the whorls are nearly flat on the outside, giving the shell a smooth cone appearance. Lioplacodes has bulbous whorls like Campeloma, but the overall cone-shape of the shell is much more pointy (like a stubby unicorn horn). Like their modern counterparts, these snails most likely lived between 3-11 years. They had a varied diet, including carrion and vegetation. This entry was posted in The Conglomerate and tagged campeloma, fossil, snail on May 29, 2015 by NDrockclub. 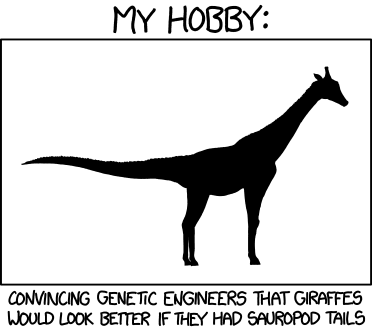 This entry was posted in The Conglomerate and tagged comic, dinosaur, humor, xkcd on May 7, 2015 by NDrockclub. External, weathered surface of a septarian nodule. A “concretion” refers to a type of mineral deposit, where layers of precipitated minerals are attracted to a starting nucleus (such as shell or bone) – much like how a pearl forms. Generally this occurs in water-rich environment, where there are minimal restrictions or obstructions to the concretion growth, resulting in a round shape. Numerous concretions may start growing near each other, then merge to form larger masses. These particular concretions contain angular cracks and cavities. The word “septarian” comes from the Latin word septum, meaning a wall or partition, referring to the cracks riddling through these concretions. It is believed the cracks are formed from shrinkage of material – where the outside deposited material is denser or hard, while the innermost material is softer, which shrinks and cracks over time. These cracks are then filled with precipitate minerals such as calcite or siderite. 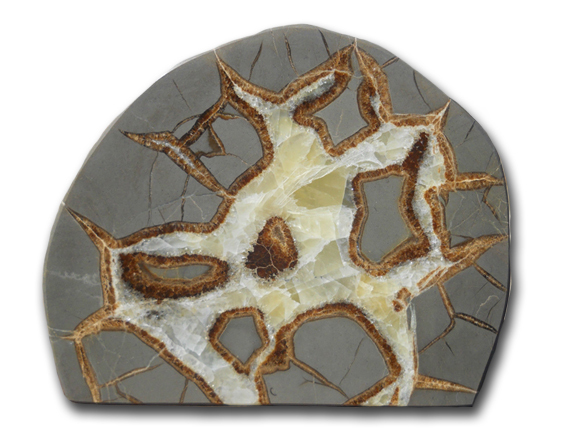 Internal polished surface of septarian nodule, showing calcite and iron-rich deposits. Septarian nodules are common in the northeastern part of North Dakota, near the Pembina Gorge. 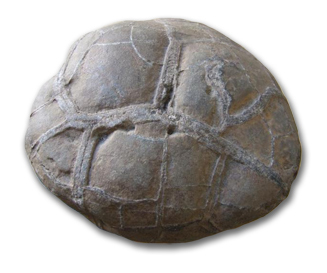 As they weather out of the ground, the softer, original concretionary material erodes faster than the cracks, giving the nodule a turtle-shell like appearance. These are often mistaken for fossils. Buchanan, Rex C., Tolsted, Laura L., and Swineford, Ada, 1986, Kansas Rocks and Minerals: Kansas Geological Survey, Educational Series 2, 60 p.
This entry was posted in The Conglomerate and tagged concretion, mineral, nodule, rock, septarian on April 21, 2015 by NDrockclub. 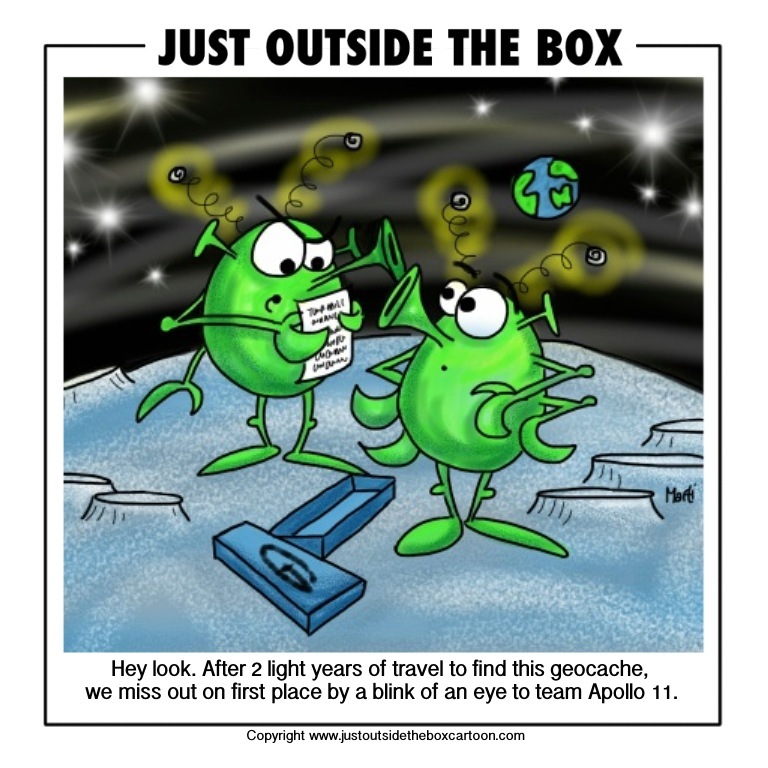 This entry was posted in The Conglomerate and tagged comic, geocache, humor, just outside the box on April 10, 2015 by NDrockclub. Quartz is a very common mineral, with numerous shapes and colors. For as long as people have enjoyed shiny things, quartz has been used in jewelry and carvings. Different types of quartz include: chalcedony (white, lightly colored), agate (multi-colored, banded), onyx (agate with straight, consistent bands), jasper (red-brown), aventurine (chalcedony with shimmering inclusions), tiger’s eye (gold to red-brown), amethyst (purple), citrine (yellow to orange), prasiolite (light green), rose (pink), smoky (brown to gray), carnelian (red-orange), and others. The biggest difference in forms is whether the mineral is macrocrystalline (showing individual crystals), or microcrystalline (tiny crystals, visible under magnification). Transparent varieties showing good crystal forms such as amethyst or citrine would be macrocrystalline. Quartz can be found as a component of many other rocks and minerals – granites, sandstone, and schist, for example. Crystals are generally six-sided, but commonly twin. It is a 7 on the Mohs scale, with a white streak. The chemical formula for quartz is SiO2 . 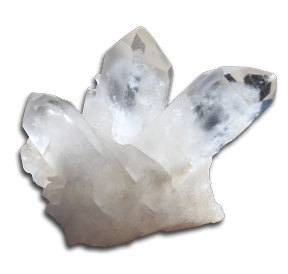 As the second most common mineral found on earth (the most common being feldspar), quartz can be found world-wide. It is piezoelectric – meaning it generates an electrical charge if put under stress. It is used as an oscillator in radios, watches, gauges, etc. Quartz sand is used to make glass, as well as a sandblasting abrasive. This entry was posted in The Conglomerate and tagged crystal, mineral, quartz on April 7, 2015 by NDrockclub.